Want to hear a funny story? When we bought the slow cooker a few years ago, my husband thought it would save us LOTS of time! He thought that we did not need to prep the vegetables or meat before, that the slow cooker would do everything! Really, I told him! I believe that the slow cooker saves a lot of time! We still need to cut the vegetables, etc! But I do not have to worry about the cooking for hours! Whereas with the regular cooking, I need to check it every 20 minutes! What do you think? Do you think slow cooker recipes save time? Slow cooker recipes are life savers for me! You mix all ingredients, throw them in slow cooker and let it cook while you do your other stuff! But I always cook the same slow cooker recipe , over and over: the beef mushroom and saffron! You know when you like a recipe and you just cook it! I do the same. Until one day you notice that no one is touching his plate! So I try to find new recipes to please my small crowd. I bet you do the same! Since it is fall and we have those amazing pumpkins and butternut squash vegetables, I try to add them to my weekly cooking schedule (yes I have a weekly calendar for the cooking)! Last week I tried the roasted pumpkin soup! This week I tried this Veal, Apples and Butternut Squash casserole recipe (inspired by my mom). I am not a fan of adding fruits to my meals but it was worth the try! This is the first time I have cooked butternut in a slow cooker. I usually use it as the main ingredient in my hearty butternut squash soup recipe. In a large saucepan, put the carrots, the butternut squash and meat! Top with the rest of the ingredients and the flour! Bring to boil and then transfer to slow cooker! Cook for 6 to 7 hours on high heat! Result: Delicious! I served it with white rice! My teenager needs pasta or rice in each meal! My daughter licked every bit of it! Would you try apples in your recipes? more right here frequently. I’m rather sure I’ll learn many new stuff proper right here! I just love the flavors in this dish. Thanks so much for sharing your great recipe with Full Plate Thursday and enjoy your Thanksgiving week! G’day! A very warm, hearty winter’s dish! Can almost smell it! It looks delish! This looks so good! YUM!!!! I do think it saves time, yes, you have to prep, but you don’t have to sit there and watch it. Without our crock, we would have had many more burnt dinners LOL! totally agree: Cooking requires preparation, cleaning, etc (even in slow cooker). But at least we don’t have to worry about burnt meals as you said!! Slow cookers are such an amazing kitchen tool! I love recipes that use seasonal flavors, like the apples & squash in this meal. 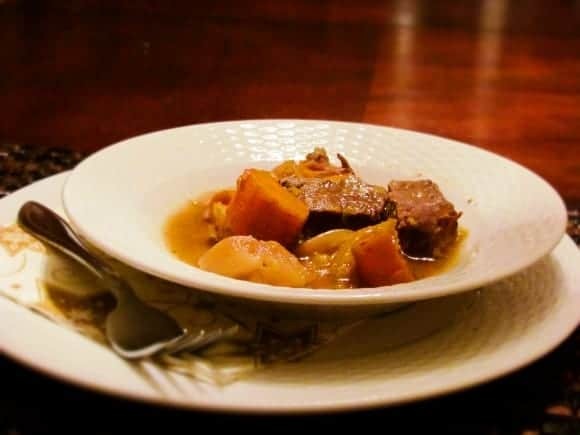 Yes, slow cooker meals are the best! Throw everything in in the morning and it’s ready to eat in the evening…. I’m always looking for new recipes, thanks for sharing! I use my slow cooker a lot, but have never cooked veal in it. This looks really good! What a hearty meal. I love cooking in the crockpot! Thank you! It definetely is!